I did finish the previous mug mat. But I messed up the binding and I really hated it. The recipient told me to send it anyway. - I just can't. I will trim the binding off, finish the edges somehow and use it for something for my house. Meanwhile, I did a do over. This time I did the "no binding" method that I used on the Nana's oatmeal mat back in 2012. Wow, more than five years ago. No wonder I didn't remember how I did it. Here is the new one. I am very happy with it. This one has a much more artistic flowing look to it. I also added a bit of blue and purple to this one with just a couple of pops of yellow. That yellow fabric with the dots, snails and starfish is leftover from my pillow cases. I hope the sweet lady that is getting it loves it as much as I do. I even did a tiny bit of curved piecing in it -there at the bottom. While I was quilting it, I ran out of bobbin thread. So I started filling a bobbin from the spool- the only one I have of this color! I looked up and saw the spool showing and stopped the bobbin quickly. Then I took a deep breath and went back to quilting. When I was done, this is all that was left on the spool. Whew! 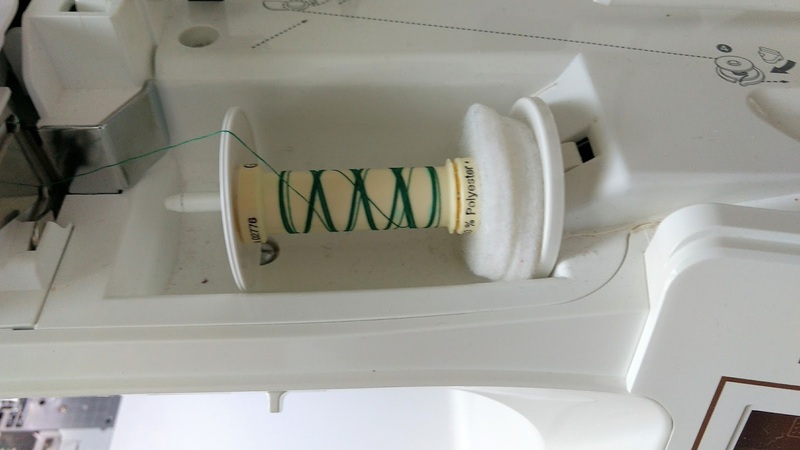 Here's hoping your bobbins and spools don't run out at inopportune times! so frustrating to have the spool and bobbins go empty. Love this one and your are right....real artsy. This is so “Gene-ish”! 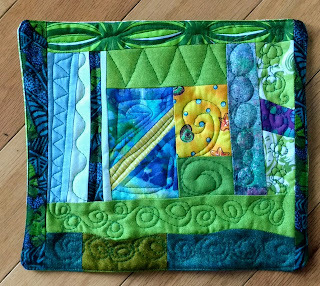 Terrific flow, cheerful colors, and awesome FMQ. Your Nana’s oatmeal mat had cheater fabric? You have come a long way since then. Lucky you not to run out of thread while quilting! 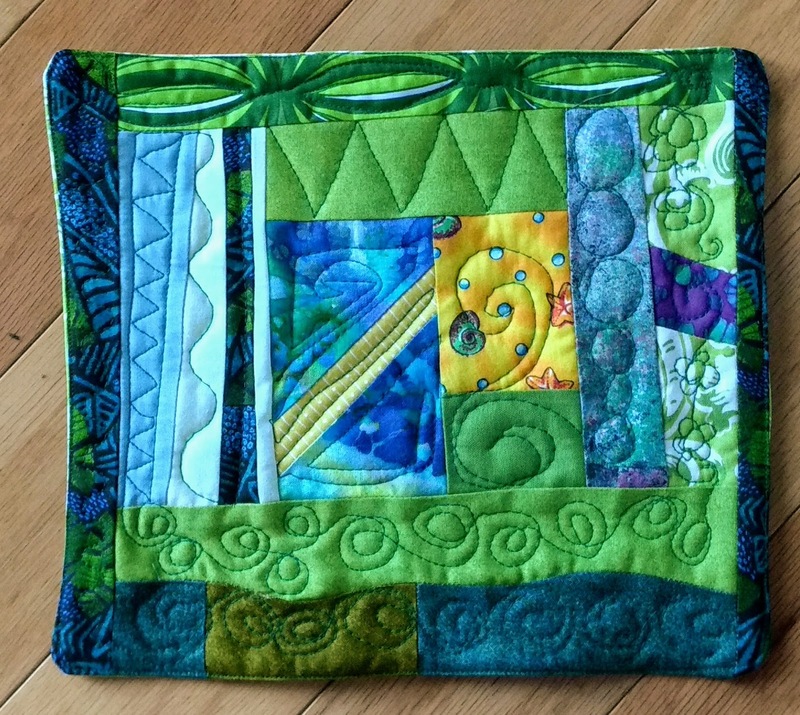 Is the no-binding method you used a sort of pillow-casing, then stitching all around? I’ve learned that one well since I’m not hand-stitching regular binding these days. You are right (since I know who this is for ;) she is a very sweet lady! Good one....love your new finish. I prefer small ones with no binding finish anyway! The thread usually runs out because I forget to check.....and I have had to switch to a different color. I always claim it was on purpose. But we know better! I like this version. It feels like a painting in a picture frame. I prefer my art style quilted projects to not have binding. It feels more fluid to me. Oh wow! You got lucky with the thread. This mug mat really turned out nice. I do like it without the traditional binding.